Stephen William Hawking CH CBE FRS FRSA (January 8, 1942 – March 14, 2018) was an English theoretical physicist, cosmologist, author, and Director of Research at the Centre for Theoretical Cosmology within the University of Cambridge. His scientific works included a collaboration with Roger Penrose on gravitational singularity theorems in the framework of general relativity and the theoretical prediction that black holes emit radiation, often called Hawking radiation. Hawking was the first to set out a theory of cosmology explained by a union of the general theory of relativity and quantum mechanics. Despite being diagnosed with a rare early-onset slow-progressing form of motor neurone disease (also known as amyotrophic lateral sclerosis "ALS" or Lou Gehrig's disease) that gradually paralyzed him, Hawking pursued his research vigorously and unceasingly for over half a century. He changed the way people look at the world. 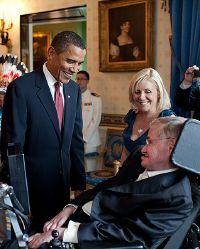 Among his many accomplishments, Hawking was a Fellow of the Royal Society (FRS), a lifetime member of the Pontifical Academy of Sciences, and a recipient of the Presidential Medal of Freedom, the highest civilian award in the United States. He was the Lucasian Professor of Mathematics at the University of Cambridge between 1979 and 2009 and achieved commercial success with works of popular science. His book A Brief History of Time appeared on the British Sunday Times best-seller list for a record-breaking 237 weeks. Translated into many languages, ten million copies have been sold. Hawking was born on January 8, 1942 in Oxford to Frank (1905–1986) and Isobel Eileen Hawking (née Walker; 1915–2013). Isobel worked as a secretary for a medical research institute, and Frank was a medical researcher. As a young child they lived in Highgate, in north London. Stephen had two younger sisters: Mary was born when Stephen was 18 months old, and Philippa when he was nearly five. He also had an adopted brother, Edward Frank David (1955–2003). In 1950, when Hawking's father became head of the division of parasitology at the National Institute for Medical Research, the family moved to St Albans, Hertfordshire. As a family, they were considered highly intelligent and somewhat eccentric; meals were often spent with each person silently reading a book. They lived a frugal existence in a large, cluttered, and poorly maintained house, traveled in a converted London taxicab and spent their summers in a painted gypsy caravan on the Dorset Coast. Hawking began his schooling at the Byron House School in Highgate, London. In St Albans, the eight-year-old Hawking first attended St Albans High School for Girls. At that time, younger boys could attend one of the houses. Hawking attended two independent (i.e. fee-paying) schools, first Radlett School, and from September 1952, St Albans School, after passing the eleven-plus a year early. The family placed a high value on education and Hawking's father wanted his son to attend the well-regarded Westminster School. However the 13-year-old Stephen was ill on the day of the scholarship examination. His family could not afford the school fees without the financial aid of a scholarship, so he remained at St Albans. A positive consequence was that Hawking remained with a close group of friends with whom he enjoyed board games, the manufacture of fireworks, model airplanes and boats, and long discussions about Christianity and extrasensory perception. Although known at school as "Einstein," Hawking was not initially successful academically. With time, he began to show considerable aptitude for scientific subjects and, inspired by mathematics teacher Dikran Tahta, decided to read mathematics at university. Hawking's father advised him to study medicine, concerned that there were few jobs for mathematics graduates. He also wanted his son to attend University College, Oxford, his own alma mater. As it was not possible to read mathematics there at the time, Hawking decided to study physics and chemistry. Despite his headmaster's advice to wait until the next year, Hawking was awarded a scholarship after taking the examinations in March 1959. Hawking began his university education at University College, Oxford, in October 1959 at the age of 17. For the first 18 months, he was bored and lonely, finding the academic work "ridiculously easy." A change occurred during his second and third year when he developed into a popular, lively, and witty college member, interested in classical music and science fiction. Part of the transformation resulted from his decision to join the college boat club, the University College Boat Club, where he coxed a rowing crew. The rowing coach at the time noted that Hawking cultivated a daredevil image, steering his crew on risky courses that led to damaged boats. Hawking estimated that he studied about 1,000 hours during his three years at Oxford. These unimpressive study habits made sitting his finals a challenge, and he decided to answer only theoretical physics questions rather than those requiring factual knowledge. A first-class honours degree was a condition of acceptance for his planned graduate study in cosmology at the University of Cambridge. Anxious, he slept poorly the night before the examinations, and the final result was on the borderline between first- and second-class honours, making an oral examination in the form of a personal interview with the examiners necessary. Hawking was concerned that he was viewed as a lazy and difficult student, so, when asked to describe his plans, he said, "If you award me a First, I will go to Cambridge. If I receive a Second, I shall stay in Oxford, so I expect you will give me a First." After receiving his first-class BA (Hons.) degree in natural science, and completing a trip to Iran with a friend, he began his graduate work at Trinity Hall, Cambridge, in October 1962. Hawking's first year as a doctoral student was difficult. He was initially disappointed to find that he had been assigned Dennis William Sciama, one of the founders of modern cosmology, as a supervisor rather than noted Yorkshire astronomer Fred Hoyle. He also found his training in mathematics inadequate. After being diagnosed with motor neurone disease (also known as Lou Gehrig's disease) in 1963 when he was 21, Hawking fell into a depression. Although his doctors advised that he continue with his studies, he felt there was little point. However, his disease progressed more slowly than predicted. Although he had difficulty walking unsupported, and his speech was almost unintelligible, the initial diagnosis that Hawking had only two years to live proved unfounded. With Sciama's encouragement, he returned to his work. Hawking started developing a reputation for brilliance and brashness when he publicly challenged the work of Fred Hoyle and his student Jayant Narlikar at a lecture in June 1964. At the time Hawking began his graduate studies, there was much debate in the physics community about the prevailing theories of the creation of the universe: the Big Bang and Steady State theories. Inspired by Roger Penrose's theorem of a spacetime singularity in the center of black holes, Hawking applied the same thinking to the entire universe, and, during 1965, he wrote his thesis on this topic. Hawking obtained his PhD degree in applied mathematics and theoretical physics, specializing in general relativity and cosmology, in March 1966; and his essay "Singularities and the Geometry of Space-Time" shared top honors with one by Penrose to win that year's prestigious Adams Prize. Having completed his doctorate, Hawking received a research fellowship at Gonville and Caius College at Cambridge. Hawking's scientific works included collaboration with Roger Penrose on gravitational singularity theorems in the framework of general relativity and the theoretical prediction that black holes emit radiation, often called Hawking radiation. He was the first to set out a theory of cosmology explained by a union of the general theory of relativity and quantum mechanics. Hawking also wrote with several works of popular science in which he discussed his own theories and cosmology in general. These include the bestseller, A Brief History of Time. In collaboration with Roger Penrose, Hawking extended the singularity theorem concepts first explored in his doctoral thesis. They included not only the existence of singularities but also the theory that the universe might have started as a singularity. Their joint essay was the runner-up in the 1968 Gravity Research Foundation competition. In 1970 they published a proof that if the universe obeys the general theory of relativity and fits any of the models of physical cosmology developed by Alexander Friedmann, then it must have begun as a singularity. Hawking postulated what became known as the second law of black hole dynamics, that the event horizon of a black hole can never get smaller. With James M. Bardeen and Brandon Carter, he proposed the four laws of black hole mechanics, drawing an analogy with thermodynamics. To Hawking's irritation, Jacob Bekenstein, a graduate student of John Wheeler, went further—and ultimately correctly—to apply thermodynamic concepts literally. Hawking was appointed to the Sherman Fairchild Distinguished visiting professorship at the California Institute of Technology (Caltech) in 1970. He worked with a friend on the faculty, Kip Thorne, and engaged him in a scientific wager about whether the X-ray source Cygnus X-1 was a black hole. Hawking acknowledged that he had lost the bet in 1990. 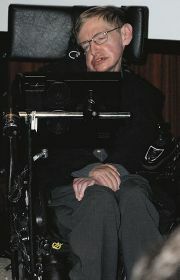 Hawking maintained ties to Caltech, spending a month there almost every year since this first visit. In the early 1970s, Hawking's work with Brandon Carter, Werner Israel, and David C. Robinson strongly supported Wheeler's no-hair theorem, which states that no matter what the original material from which a black hole is created it can be completely described by the properties of mass, electrical charge and rotation. His essay titled "Black Holes" won the Gravity Research Foundation Award in January 1971. Hawking's first book, The Large Scale Structure of Space-Time, written with George Ellis, was published in 1973. Beginning in 1973, Hawking moved into the study of quantum gravity and quantum mechanics. His work in this area was spurred by a visit to Moscow and discussions with Yakov Borisovich Zel'dovich and Alexei Starobinsky, whose work showed that according to the uncertainty principle, rotating black holes emit particles. To Hawking's annoyance, his much-checked calculations produced findings that contradicted his second law, which claimed black holes could never get smaller, and supported Bekenstein's reasoning about their entropy. The results showed that black holes emit radiation, known today as Hawking radiation, which may continue until they exhaust their energy and evaporate. In 1974, a few weeks after the announcement of Hawking radiation, Hawking was elected a Fellow of the Royal Society (FRS). Initially, Hawking radiation was controversial. By the late 1970s and following the publication of further research, the discovery was widely accepted as a significant breakthrough in theoretical physics. Hawking returned to Cambridge in 1975 to a more academically senior post, as reader in gravitational physics. The mid to late 1970s were a period of growing public interest in black holes and the physicists who were studying them. Hawking was regularly interviewed for print and television. In 1979, Hawking was elected Lucasian Professor of Mathematics at the University of Cambridge, an illustrious position, once held by Sir Isaac Newton. His inaugural lecture in this role was titled: "Is the End in Sight for Theoretical Physics?" and proposed N=8 Supergravity as the leading theory to solve many of the outstanding problems in physics. At the same time, he was making a transition in his approach to physics, becoming more intuitive and speculative rather than insisting on mathematical proofs. "I would rather be right than rigorous," he told Kip Thorne. In 1981, he proposed that information in a black hole is irretrievably lost when a black hole evaporates. This information paradox violates the fundamental tenet of quantum mechanics, and led to years of debate, including "the Black Hole War" with Leonard Susskind and Gerard 't Hooft. Hawking also began a new line of quantum theory research into the origin of the universe. In 1981 at a Vatican conference, he presented work suggesting that there might be no boundary, or beginning or ending, to the universe. 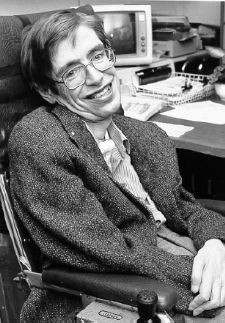 He subsequently developed this research in collaboration with Jim Hartle, and in 1983 they published a model, known as the Hartle–Hawking state. It proposed that prior to the Planck epoch, the universe had no boundary in space-time; before the Big Bang, time did not exist and the concept of the beginning of the universe is meaningless. The initial singularity of the classical Big Bang models was replaced with a region akin to the North Pole. One cannot travel north of the North Pole, but there is no boundary there – it is simply the point where all north-running lines meet and end. Honors continued to be awarded, but these awards did not significantly change Hawking's financial status and, motivated by the need to finance his children's education and home expenses, he decided in 1982 to write a popular book about the universe that would be accessible to the general public. Instead of publishing with an academic press, he signed a contract with Bantam Books, a mass market publisher. A first draft of the book, called A Brief History of Time, was completed in 1984. Peter Guzzardi, his editor at Bantam, pushed him to explain his ideas clearly in non-technical language. The book was published in April 1988 in the US and in June in the UK, and it proved to be an extraordinary success, rising quickly to the top of best-seller lists in both countries and remaining there for months. Hawking pursued his work in physics: in 1993 he co-edited a book on Euclidean quantum gravity with Gary Gibbons and published a collected edition of his own articles on black holes and the Big Bang. In 1994, at Cambridge's Newton Institute, Hawking and Penrose delivered a series of six lectures that were published in 1996 as The Nature of Space and Time. In 1997, he conceded a 1991 public scientific wager made with Kip Thorne and John Preskill of Caltech. Hawking had bet that Penrose's proposal of a "cosmic censorship conjecture" – that there could be no "naked singularities" unclothed within a horizon – was correct. After discovering his concession might have been premature, a new and more refined wager was made. This one specified that such singularities would occur without extra conditions. The same year, Thorne, Hawking, and Preskill made another bet, this time concerning the black hole information paradox. Thorne and Hawking argued that since general relativity made it impossible for black holes to radiate and lose information, the mass-energy and information carried by Hawking radiation must be "new," and not from inside the black hole event horizon. Since this contradicted the quantum mechanics of microcausality, quantum mechanics theory would need to be rewritten. Preskill argued the opposite, that since quantum mechanics suggests that the information emitted by a black hole relates to information that fell in at an earlier time, the concept of black holes given by general relativity must be modified in some way. 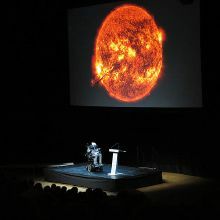 Hawking also maintained his public profile, including bringing science to a wider audience. A film version of A Brief History of Time, directed by Errol Morris and produced by Steven Spielberg, premiered in 1992. A popular-level collection of essays, interviews, and talks titled Black Holes and Baby Universes and Other Essays was published in 1993, and a six-part television series Stephen Hawking's Universe and a companion book appeared in 1997. Hawking continued his writings for a popular audience, publishing The Universe in a Nutshell in 2001, and A Briefer History of Time, which he wrote in 2005 with Leonard Mlodinow to update his earlier works with the aim of making them accessible to a wider audience. God Created the Integers appeared in 2006. In 2007, Hawking and his daughter Lucy published George's Secret Key to the Universe, a children's book designed to explain theoretical physics in an accessible fashion and featuring characters similar to those in the Hawking family. The book was followed by sequels in 2009, 2011, 2014 and 2016. By 2003, consensus among physicists was growing that Hawking was wrong about the loss of information in a black hole. In a 2004 lecture in Dublin, he conceded his 1997 bet with Preskill, but described his own, somewhat controversial solution to the information paradox problem, involving the possibility that black holes have more than one topology. In January 2014, he called the alleged loss of information in black holes his "biggest blunder." Hawking said that not all information is lost when something enters a black hole and there might be a possibility to retrieve information from a black hole according to his theory. Along with Thomas Hertog at CERN and Jim Hartle, from 2006 on Hawking developed a theory of "top-down cosmology," which says that the universe had not one unique initial state but many different ones, and therefore that it is inappropriate to formulate a theory that predicts the universe's current configuration from one particular initial state. Top-down cosmology posits that the present "selects" the past from a superposition of many possible histories. In doing so, the theory suggests a possible resolution of the fine-tuning question. As part of another longstanding scientific dispute, Hawking had emphatically argued, and bet, that the Higgs boson would never be found. The particle was proposed to exist as part of the Higgs field theory by Peter Higgs in 1964. Hawking and Higgs engaged in a heated and public debate over the matter in 2002 and again in 2008, with Higgs criticizing Hawking's work and complaining that Hawking's "celebrity status gives him instant credibility that others do not have." The particle was discovered in July 2012 at CERN, following construction of the Large Hadron Collider. Hawking quickly conceded that he had lost his bet and said that Higgs should win the Nobel Prize for Physics, which he did in 2013. Hawking retired as Lucasian Professor of Mathematics in 2009. However, he continued his work as usual at Cambridge University as Emeritus Lucasian Professor at the university, an honorary title, saying that he planned to continue working as long as he was able. While Hawking was a graduate student at Cambridge, he developed a relationship with Jane Wilde, a friend of his sister. They had met shortly before his late 1963 diagnosis of motor neurone disease. The couple became engaged in October 1964 and Hawking later said that the engagement gave him "something to live for." They were married on July 14, 1965. During their first years of marriage, Jane lived in London during the week while she completed her degree. Their first son, Robert, was born in May 1967. Their daughter, Lucy, was born in 1970. A third child, Timothy, was born in April 1979. Hawking's disability meant that the responsibilities of home and family rested firmly on his wife's increasingly overwhelmed shoulders. Upon his appointment in 1974 to a year-long position at the California Institute of Technology in Pasadena, California, Jane proposed that a graduate or post-doctoral student live with them and help with his care. Hawking accepted, and Bernard Carr traveled with them as the first of many students who fulfilled this role. The family spent a generally happy and stimulating year in Pasadena. Hawking returned to Cambridge in 1975 to a new home and a new job, as reader. Don Page, with whom Hawking had begun a close friendship at Caltech, arrived to work as the live-in graduate student assistant. With Page's help and that of a secretary, Jane's responsibilities were reduced so she could return to her thesis and her new interest in singing. By the 1980s, Hawking's marriage had been strained for many years. Jane felt overwhelmed by the intrusion into their family life of the required nurses and assistants. Hawking's view of religion also contrasted with her strong Christian faith and resulted in tension. The impact of his celebrity status was also challenging. In 1977, Jane had met organist Jonathan Hellyer Jones when singing in a church choir. Hellyer Jones became close to the Hawking family, and by the mid-1980s, he and Jane had developed romantic feelings for each other. According to Jane, her husband was accepting of the situation, stating "he would not object so long as I continued to love him." Hawking had grown close to one of his nurses, Elaine Mason, to the dismay of some colleagues, caregivers, and family members, who were disturbed by her strength of personality and protectiveness. After his divorce from Jane in 1995, Hawking married Mason in September, 1995. Jane and Hellyer Jones married in 1996. In 1999, Jane published a memoir, describing her marriage to Hawking and its breakdown. Its revelations caused a sensation in the media but, as was his usual practice regarding his personal life, Hawking made no public comment except to say that he did not read biographies about himself. In 2006, Hawking and Mason quietly divorced, and Hawking resumed closer relationships with Jane, his children, and his grandchildren. Reflecting this happier period, a revised version of Jane's book, called Travelling to Infinity: My Life with Stephen, appeared in 2007. It was made into the film, The Theory of Everything, starring Eddie Redmayne as Hawking. Hawking had a rare early-onset slow-progressing form of motor neurone disease (also known as amyotrophic lateral sclerosis, "ALS", or Lou Gehrig's disease). Hawking had experienced increasing clumsiness during his final year at Oxford, including a fall on some stairs and difficulties when rowing. The problems worsened, and his speech became slightly slurred. His family noticed the changes when he returned home for Christmas, and medical investigations were begun. The diagnosis of motor neurone disease came when Hawking was 21, in 1963. At the time, doctors gave him a life expectancy of two years. In the late 1960s, Hawking's physical abilities declined: he began to use crutches and ceased lecturing regularly. As he slowly lost the ability to write, he developed compensatory visual methods, including seeing equations in terms of geometry. The physicist Werner Israel later compared the achievements to Mozart composing an entire symphony in his head. Hawking was fiercely independent and unwilling to accept help or make concessions for his disabilities. He preferred to be regarded as "a scientist first, popular science writer second, and, in all the ways that matter, a normal human being with the same desires, drives, dreams, and ambitions as the next person." His wife, Jane Hawking, later noted: "Some people would call it determination, some obstinacy. I've called it both at one time or another." He required much persuasion to accept the use of a wheelchair at the end of the 1960s, but ultimately became notorious for the wildness of his wheelchair driving. Hawking's speech deteriorated, and by the late 1970s he could be understood by only his family and closest friends. To communicate with others, someone who knew him well would interpret his speech into intelligible speech. Spurred by a dispute with the university over who would pay for the ramp needed for him to enter his workplace, Hawking and his wife campaigned for improved access and support for those with disabilities in Cambridge, including adapted student housing at the university. During a visit to CERN in mid-1985, Hawking contracted pneumonia, which in his condition was life-threatening; he was so ill that Jane was asked if life support should be terminated. She refused, but the consequence was a tracheotomy, which required round-the-clock nursing care and the removal of what remained of his speech. Nurses were hired for the three shifts required to provide the support he required. One of those employed was Elaine Mason, who was to become Hawking's second wife. For communication, initially Hawking raised his eyebrows to choose letters on a spelling card, but in 1986 he received a computer program called the "Equalizer" from Walter Woltosz, CEO of Words Plus. Woltosz had developed an earlier version of the software to help his mother-in-law, who also suffered from ALS and had lost her ability to speak and write. In a method he used for the rest of his life, Hawking could now simply press a switch to select phrases, words, or letters from a bank of about 2,500–3,000 that were scanned. Lectures were prepared in advance and were sent to the speech synthesiser in short sections to be delivered. Released from the need to use somebody to interpret his speech, Hawking commented that "I can communicate better now than before I lost my voice." The voice he used, called "Perfect Paul," had an American accent and is no longer produced. Despite the later availability of other voices, Hawking retained this original voice, saying that he preferred it and identified with it. Originally, Hawking activated a switch using his hand and could produce up to 15 words a minute. Hawking gradually lost the use of his hand, and in 2008 he began to control his communication device with movements of his cheek muscles. His ability to communicate continued to decline and by 2011 he could create only one word per minute. Hawking collaborated with Intel researchers on systems that could translate his brain patterns or facial expressions into switch activations. After several prototypes that did not perform as planned, they settled on an adaptive word predictor made by the London-based startup SwiftKey, which used a system similar to his original technology. Hawking had an easier time adapting to the new system, which was further developed after inputting large amounts of Hawking's papers and other written materials and uses predictive software similar to smartphone keyboards. By 2009 he could no longer drive his wheelchair independently. The same people who created his new typing mechanics worked on a method to drive his chair using movements made by his chin. This proved difficult, since Hawking could not move his neck, and trials showed that while he could indeed drive the chair, the movement was sporadic and jumpy. In general, Hawking had ambivalent feelings about his role as a disability rights champion: while wanting to help others, he also sought to detach himself from his illness and its challenges. However, starting in the 1990s, Hawking accepted the mantle of role model for disabled people, lecturing and participating in fundraising activities. At the turn of the century, he and eleven other luminaries signed the Charter for the Third Millennium on Disability, which called on governments to prevent disability and protect the rights of the disabled. In late 2006, Hawking revealed in a BBC interview that one of his greatest unfulfilled desires was to travel to space; on hearing this, Richard Branson offered a free flight into space with Virgin Galactic, which Hawking immediately accepted. Besides personal ambition, he was motivated by the desire to increase public interest in spaceflight and to show the potential of people with disabilities. 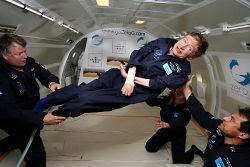 In April 2007, Hawking flew aboard a specially-modified Boeing 727–200 jet operated by Zero-G Corp off the coast of Florida to experience weightlessness. Fears that the maneuvers would cause him undue discomfort proved groundless, and the flight was extended to eight parabolic arcs. It was described as a successful test to see if he could withstand the g-forces involved in space flight. At the time, the date of Hawking's trip to space was projected to be as early as 2009, but commercial flights to space did not commence before his death. Stephen Hawking died peacefully in his home in Cambridge, England, early in the morning of March 14, 2018, at the age of 76. He was eulogized by figures in science, entertainment, politics, and other areas. The flag at Cambridge's Gonville and Caius College flew at half-mast and a book of condolences was signed by students and visitors. A tribute was made to Hawking in the closing speech by IPC President Andrew Parsons at the closing ceremony of the 2018 Paralympic Winter Games in Pyeongchang, South Korea. Hawking's private funeral took place at 2 pm on the afternoon of March 31, 2018, at Great St Mary's Church, Cambridge. A Thanksgiving service was scheduled to be held in Westminster Abbey on June 15, 2018, during which his ashes would be interred in the Abbey's nave, next to the grave of Sir Isaac Newton and near that of Charles Darwin. Hawking directed at least fifteen years before his death that the Bekenstein–Hawking entropy equation be written on his tombstone as his epitaph. where is the black hole entropy, is the surface area of the black hole event horizon, is Boltzmann's constant, is Einstein's speed of light, is Planck's constant and is Newton's gravitational constant. The subscript BH stands for either "black hole" or "Bekenstein–Hawking." Hawking stated that the greatest mystery he would like solved was "to know why the universe exists, why there is something greater than nothing." In his bestselling 1988 book, A Brief History of Time, Hawking wrote that developing a complete theory (the "theory of everything") "would be the ultimate triumph of human reason – for then we should know the mind of God." What could define God [is thinking of God] as the embodiment of the laws of nature. However, this is not what most people would think of as God. They made a human-like being with whom one can have a personal relationship. When you look at the vast size of the universe and how insignificant an accidental human life is in it, that seems most impossible. Before we understand science, it is natural to believe that God created the universe. But now science offers a more convincing explanation. What I meant by 'we would know the mind of God' is, we would know everything that God would know, if there were a God, which there isn't. I'm an atheist. In 2006, Hawking posed an open question on the Internet: "In a world that is in chaos politically, socially and environmentally, how can the human race sustain another 100 years?" He later clarified: "I don't know the answer. That is why I asked the question, to get people to think about it, and to be aware of the dangers we now face." Hawking expressed concern that life on Earth is at risk from a sudden nuclear war, a genetically engineered virus, global warming, or other dangers humans have not yet thought of. Such a planet-wide disaster need not result in human extinction if the human race were to be able to colonize additional planets before the disaster. 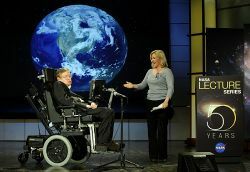 Hawking created Stephen Hawking: Expedition New Earth, a documentary on space colonization, as a 2017 episode of Tomorrow's World. His final words to the world appeared posthumously, in April 2018, in the form of a Smithsonian TV Channel documentary entitled, Leaving Earth: Or How to Colonize a Planet. Hawking stated that, given the vastness of the universe, aliens likely exist, but that contact with them should be avoided. He warned that aliens might pillage Earth for resources. In 2010 he said, "If aliens visit us, the outcome would be much as when Columbus landed in America, which didn't turn out well for the Native Americans." In July 2015, Hawking helped launch Breakthrough Initiatives, an effort to search for extraterrestrial life. It would take off on its own, and re-design itself at an ever increasing rate ... Humans, who are limited by slow biological evolution, couldn't compete, and would be superseded. Hawking argued that computer viruses should be considered a new form of life. He quipped, "maybe it says something about human nature, that the only form of life we have created so far is purely destructive. Talk about creating life in our own image." In 1988, Stephen Hawking, Arthur C. Clarke and Carl Sagan were interviewed in God, the Universe and Everything Else. They discussed the Big Bang theory, God, and the possibility of extraterrestrial life. At the release party for the home video version of the A Brief History of Time, Leonard Nimoy, who had played Spock on Star Trek, learned that Hawking was interested in appearing on the show. Nimoy made the necessary contact, and Hawking played a holographic simulation of himself in an episode of Star Trek: The Next Generation in 1993. The same year, his synthesizer voice was recorded for the Pink Floyd song "Keep Talking", and in 1999 for an appearance on The Simpsons. Hawking appeared in documentaries titled The Real Stephen Hawking (2001), Stephen Hawking: Profile (2002),and Hawking (2013), and the documentary series Stephen Hawking, Master of the Universe (2008). Hawking allowed the use of his copyrighted voice in the biographical 2014 film The Theory of Everything, in which he was portrayed by Eddie Redmayne in an Academy Award-winning role. In March 2018, just days before his death, Hawking was the guest of Neil deGrasse Tyson on StarTalk. Also Broadcast in March 2018, Hawking was the voice of The Book Mark II on The Hitchhiker's Guide to the Galaxy radio series. 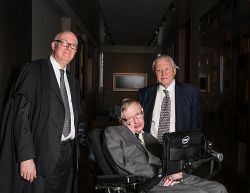 Hawking with University of Oxford librarian Richard Ovenden (left) and naturalist David Attenborough (right) at the opening of the Weston Library, Oxford, in March 2015. Ovenden awarded the Bodley Medal to Hawking and Attenborough at the ceremony. In 1975, he was awarded both the Eddington Medal and the Pius XI Gold Medal, and in 1976 the Dannie Heineman Prize, the Maxwell Prize and the Hughes Medal. He was appointed a professor with a chair in gravitational physics in 1977. The following year he received the Albert Einstein Medal and an honorary doctorate from the University of Oxford. In 1981 he was awarded the American Franklin Medal, and in the 1982 New Year Honours appointed a Commander of the Order of the British Empire (CBE). He also received the Gold Medal of the Royal Astronomical Society (1985), the Paul Dirac Medal (1987) and, jointly with Roger Penrose, the prestigious Wolf Prize (1988). In the 1989 Birthday Honours, he was appointed a Companion of Honour (CH). Hawking received the 2015 BBVA Foundation Frontiers of Knowledge Award in Basic Sciences shared with Viatcheslav Mukhanov for discovering that the galaxies were formed from quantum fluctuations in the early Universe. At the 2016 Pride of Britain Awards, Hawking received the lifetime achievement award "for his contribution to science and British culture." After receiving the award from Prime Minister Theresa May, Hawking humorously requested that she not seek his help with Brexit. In July 2017, Hawking was awarded an Honorary Doctorate from Imperial College London. Stephen Hawking has been described as "a man who has quite simply changed the way we look at the world." He was born on the 300th anniversary of Galileo's death and died on the 139th anniversary of Einstein's birth. 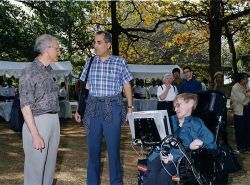 Hawking was a member of the Advisory Board of the Starmus Festival, and had a major role in acknowledging and promoting science communication. The Stephen Hawking Medal for Science Communication is an annual award initiated in 2016 to honour members of the arts community for contributions that help build awareness of science. Several buildings have been named after him, including the Stephen W. Hawking Science Museum in San Salvador, El Salvador, the Stephen Hawking Building in Cambridge, and the Stephen Hawking Centre at the Perimeter Institute in Canada. Appropriately, given Hawking's association with time, he unveiled the mechanical "Chronophage" (or time-eating) Corpus Clock at Corpus Christi College, Cambridge in September 2008. During his career, Hawking supervised 39 successful PhD students, and one who did not complete the program. In March 2018, it was announced that two Russian astronomers who discovered GRB180316A, a newborn black hole in the Ophiuchus constellation had dedicated their find to Stephen Hawking, having discovered it two days after his death. Co-written with his daughter Lucy. Hawking, Stephen. "Singularities and the geometry of spacetime" December 13, 1966. Published in The European Physical Journal H, November 10, 2014. Retrieved May 31, 2018. Hawking, S.W., and R. Penrose. "The Singularities of Gravitational Collapse and Cosmology" Proceedings of the Royal Society A: Mathematical, Physical and Engineering Sciences 314(1519) (1970):529–548. Hawking, S. "Gravitational Radiation from Colliding Black Holes" Physical Review Letters 26(21) (1971):1344–1346. Hawking, S.W. "Black holes in general relativity" Communications in Mathematical Physics 25(2) (1972): 152–166. Hawking, S.W. "Black hole explosions?" Nature 248(5443) (1974):30–31. Hawking, S.W. "The development of irregularities in a single bubble inflationary universe" Physics Letters B 115(4) (1982):295–297. Hartle, J., and S. Hawking. "Wave function of the Universe" Physical Review D 28(12) (1983):2960–2975. Hawking, S.W., and T. Herzog. "Populating the Landscape: A Top Down Approach Phys. Rev. D73 (12) (2006): 123527. Retrieved June 2, 2018. ↑ 1.00 1.01 1.02 1.03 1.04 1.05 1.06 1.07 1.08 1.09 1.10 1.11 1.12 1.13 1.14 Kitty Ferguson, Stephen Hawking: His Life and Work (Paragon, 2012, ISBN 978-1445844237). ↑ 2.0 2.1 Stephen Hawking: “I’m happy if I have added something to our understanding of the universe” Radio Times, December 7, 2013. Retrieved May 15, 2018. ↑ 3.0 3.1 3.2 3.3 Kristine Larsen, Stephen Hawking: A Biography (Prometheus Books, 2007, ISBN 978-1591025740). ↑ Kitty Ferguson, Stephen Hawking: An Unfettered Mind (St. Martin's Griffin, 2017, ISBN 978-1250139368). ↑ 5.00 5.01 5.02 5.03 5.04 5.05 5.06 5.07 5.08 5.09 5.10 5.11 Michael White and John Gribbin, Stephen Hawking: A Life in Science (Joseph Henry Press, 2002, ISBN 978-0309084109). ↑ Stephen Hawking, My brief history (Bantam, 2013, ISBN 978-0345535283). ↑ Stephen W. Hawking (ed. ), Stephen Hawking's A brief history of time: A reader's companion (Bantam Books, 1992, ISBN 978-0553077728). ↑ James Geach, Stephen Hawking's PhD thesis, explained simply World Economic Forum, October 30, 2017. Retrieved May 31, 2018. ↑ George F.R. Ellis, Stephen Hawking’s 1966 Adams Prize Essay. Retrieved May 31, 2018. ↑ S.W. Hawking and W. Israel (eds. ), Three Hundred Years of Gravitation (Cambridge University Press, 1989 ISBN 978-0521379762). ↑ Award Essays by Year - 1971. Gravity Research Foundation. Retrieved June 1, 2018. ↑ Stephen Hawking The Royal Society. Retrieved June 1, 2018. ↑ 13.0 13.1 Stephen Hawking to retire as Cambridge's Professor of Mathematics The Daily Telegraph, October 23, 2008. Retrieved June 1, 2018. ↑ Leonard Susskind, The Black Hole War: My Battle with Stephen Hawking to Make the World Safe for Quantum Mechanics (Little, Brown and Company, 2008, ISBN 978-0316016407). ↑ Eric Baird, Relativity in Curved Spacetime: Life Without Special Relativity (Chocolate Tree Books, 2007, ISBN 978-0955706806). ↑ Tim Radford, How God propelled Stephen Hawking into the bestsellers lists The Guardian, July 31, 2009. Retrieved June 1, 2018. ↑ 17.0 17.1 Stephen W. Hawking, Kip S. Thorne, John P. Preskill, Black Hole Information Bet. Pasadena, California, February 6, 1997. Retrieved June 1, 2018. ↑ John Preskill, On Hawking’s Concession July 24, 2004. Retrieved June 1, 2018. ↑ Matt Kwong, Stephen Hawking's black holes 'blunder' stirs debate CBC News, January 29, 2014. Retrieved June 2, 2018. ↑ Jacob Aron, Stephen Hawking says he has a way to escape from a black hole New Scientist, August 25, 2015. Retrieved June 2, 2018. ↑ Roger Highfield, Stephen Hawking: driven by a cosmic force of will The Daily Telegraph, January 3, 2012. Retrieved June 1, 2018. ↑ Jonathan Amos, Higgs: Five decades of noble endeavour BBC News, October 8, 2013. Retrieved June 2, 2018. ↑ Jane Hawking, Travelling to Infinity: My Life With Stephen (Alma Books, 2010, ISBN 978-1846881152). ↑ Jane Hawking, Music to Move the Stars: A Life with Stephen (Macmillan, 1999, ISBN 978-0333746868). ↑ Eddie Redmayne wins first Oscar for 'Theory of Everything' Reuters, February 22, 2015. Retrieved May 15, 2018. ↑ 26.0 26.1 26.2 Joao Medeiros, How Intel Gave Stephen Hawking a Voice Wired, January 13, 2015. Retrieved May 31, 2018. ↑ Tom Leonard and Alistair Osborne, Branson to help Hawking live space dream The Telegraph, April 27, 2007. Retrieved May 31, 2018. ↑ Martin Rees, Stephen Hawking (1942–2018) Nature, March 14, 2018. Retrieved May 30, 2018. ↑ Roger Penrose, 'Mind over matter': Stephen Hawking The Guardian, March 14, 2018. Retrieved May 30, 2018. ↑ Stephen Hawking: Tributes pour in for 'inspirational' physicist BBC News, March 14, 2018. Retrieved May 30, 2018. ↑ Sarah Marsh, Cambridge colleagues pay tribute to 'inspirational' Hawking The Guardian, March 14, 2018. Retrieved May 30, 2018. ↑ IPC to Pay Tribute to Stephen Hawking During PyeongChang Paralympics Closing Ceremony Yonhap News Agency, March 15, 2018. Retrieved May 30, 2018. ↑ Prof Stephen Hawking funeral: Legacy 'will live forever'. BBC News, March 31, 2018. Retrieved May 30, 2018. ↑ Stuart Clark, The Unknown Universe: A New Exploration of Time, Space, and Modern Cosmology (Pegasus Books, 2016, ISBN 978-1681771533). ↑ Andrew Griffin, Stephen Hawking death: The equation the professor asked to be put on his tombstone The Independent, March 14, 2018. Retrieved May 30, 2018. ↑ 36.0 36.1 36.2 Ki Mae Heussner, Stephen Hawking on Religion: 'Science Will Win' ABC News, June 7, 2010. Retrieved May 29, 2018. ↑ Stephen Hawking, A Brief History of Time (Bantam, 1998, ISBN 978-0553380163). ↑ 38.0 38.1 Michael Stone, Stephen Hawking makes it official: He’s an atheist Patheos, September 25, 2014. Retrieved May 29, 2018. ↑ Alan Boyle, 'I'm an Atheist': Stephen Hawking on God and Space Travel NBC News, September 23, 2014. Retrieved May 29, 2018. ↑ Ian Sample, Stephen Hawking: 'There is no heaven; it's a fairy story' The Guardian, May 15, 2011. Retrieved May 29, 2018. ↑ Ian Sample, The great man's answer to the question of human survival: Er, I don't know The Guardian, August 2, 2006. Retrieved May 30, 2018. ↑ Sarah Knapton, Prof Stephen Hawking: disaster on planet Earth is a near certainty The Daily Telegraph, January 19, 2016. Retrieved May 30, 2018. ↑ Sarah Knapton, Tomorrow's World returns to BBC with startling warning from Stephen Hawking – we must leave Earth The Telegraph, May 2, 2017. Retrieved June 2, 2018. ↑ Dan Taylor, Stephen Hawking’s incredible last words will stun you Morning Ticker, March 24, 2018. Retrieved June 2, 2018. ↑ Stephen Hawking warns over making contact with aliens BBC News, April 25, 2010. Retrieved May 30, 2018. ↑ Gregory Katz, Searching for ET: Hawking to look for extraterrestrial life Associated Presss, July 20, 2015. Retrieved June 2, 2018. ↑ Rory Cellan-Jones, Stephen Hawking warns artificial intelligence could end mankind BBC News, December 2, 2014. Retrieved May 30, 2018. ↑ God, the Universe and Everything Else (1988) IMDb. Retrieved May 29, 2018. ↑ Michael Okuda and Denise Okuda, The Star Trek Encyclopedia: A Reference Guide to the Future (Pocket Books, 1999, ISBN 978-0671536091). ↑ Hélène Mialet, Hawking Incorporated: Stephen Hawking and the Anthropology of the Knowing Subject (University of Chicago Press, 2010, ISBN 978-0226522265). ↑ James Edgar, 'Have you still got that American voice?' Queen asks Stephen Hawking The Telegraph, May 30, 2014. Retrieved May 29, 2018. ↑ Ramin Setoodeh, How Eddie Redmayne Became Stephen Hawking in 'The Theory of Everything' Variety, October 28, 2014. Retrieved May 29, 2018. ↑ Nicholas Tufnell, 'The Hitchhikers Guide to the Galaxy' is back with the original cast CNET, March 9, 2018. Retrieved May 29, 2018. ↑ Stephen Hawking The Royal Society, December 1974. Retrieved May 29, 2018. ↑ Ordinary Academicians Pontifical Academy of Sciences. Retrieved June 2, 2018. ↑ 100 great British heroes BBC News, August 21, 2002. Retrieved June 2, 2018. ↑ Award winners : Copley Medal The Royal Society. Retrieved June 2, 2018. ↑ Ewen MacAskill, Obama presents presidential medal of freedom to 16 recipients The Guardian, August 13, 2009. Retrieved June 2, 2018. ↑ 2013 Fundamental Physics Prize Awarded to Alexander Polyakov Fundamental Physics Prize, March 21, 2013. Retrieved June 2, 2018. ↑ 60.0 60.1 Claire Corkery, Pride of Britain 2016: Stephen Hawking makes Brexit joke at PM Theresa May's expense Express, November 1, 2016. Retrieved May 29, 2018. ↑ Deborah Evanson, Stephen Hawking awarded Imperial College London's highest honour Imperial College London, July 17, 2017. Retrieved May 30, 2018. ↑ Stephen Hawking Medals For Science Communication STARMUS, December 16, 2015. Retrieved May 29, 2018. ↑ Hawking unveils 'strangest clock' BBC News, September 19, 2008. Retrieved June 2, 2018. ↑ Stephen William Hawking Mathematics Genealogy Project. Retrieved June 2, 2018. ↑ Russian astronomers devote newly-discovered black hole to Stephen Hawking Russia Today, March 21, 2018. Retrieved May 29, 2018. All links retrieved June 2, 2018. This page was last modified on 25 July 2018, at 21:15.